It's easy to find the best ramen place in little Tokyo. Just follow the line. While Mr. Ramen or whatever else on 1st street is practically empty, there is always at least a 30 minute wait outside of Daikokuya. A hard boiled egg that's been soaked overnight. Noodles done just right. 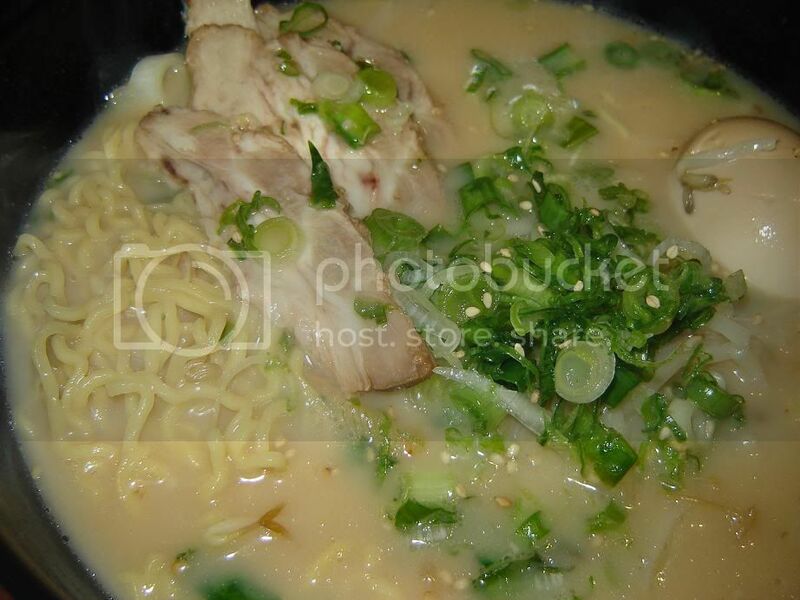 That wonderful, wonderful broth that just spells out "comfort food." 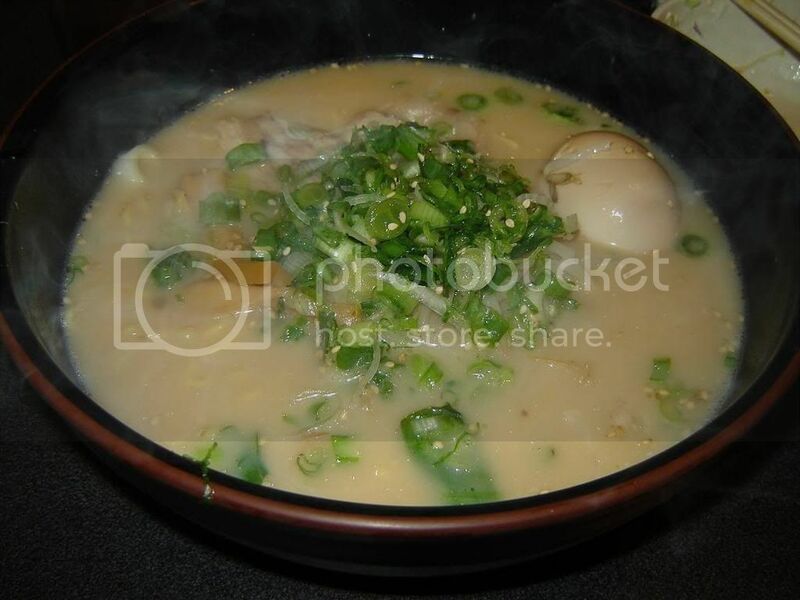 Sumptuous pieces of kurobuta, topped with lots of green onions. Oh and the sesame seeds. Yum. The kurobuta is so tender that it feels like it would just melt in your mouth. No more of that chewy chashu in my ramen for me. The whole thing is definitely fatty. That is probably why it tastes so good that you want to just gulp down the broth from the entire bowl. When I eat this I always think about the last ramen scene from Tampopo. You pick up your bowl, gulp down the entire thing. Ahhh. Went to the two Michelin starred restaurant Melisse last night, with great expectations (Michelin stars come with responsibilities!). We were 10 minutes late but were promptly seated and were accomodated even when we wanted to switch to a bigger table. They had a champagne cart, but we opted out of alcohol for the night. Since we didn't have much time, we didn't get any tasting menu. 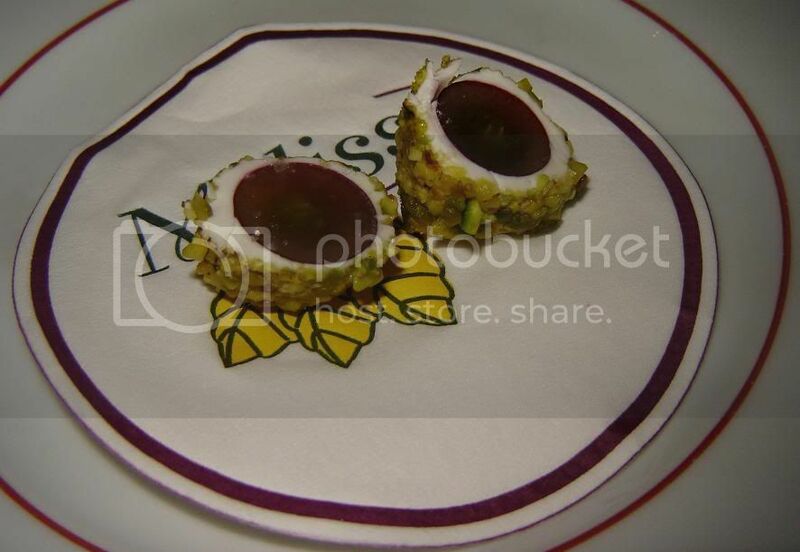 They started us with grapes coated with goat cheese and pistachio crumbs. 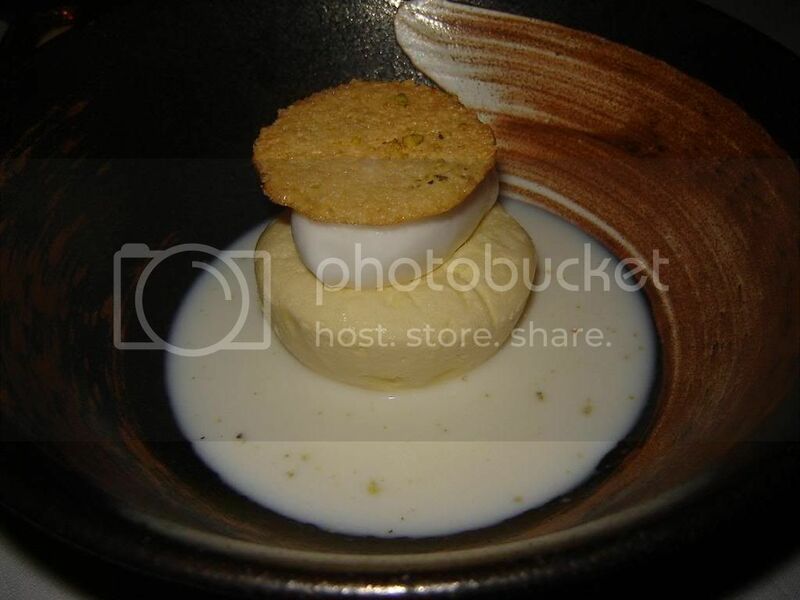 The amuse bouche was a tuna tartar, and in the shot glass was layers of passionfruit gelee, fennel flan, and topped with cashew foam. 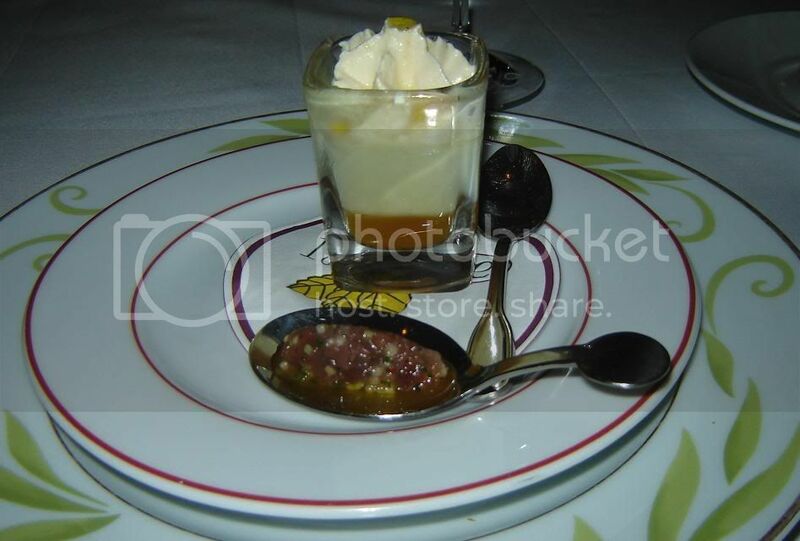 I liked the concoction in the shot glass, but the tuna tartar was unmemorable, although good. 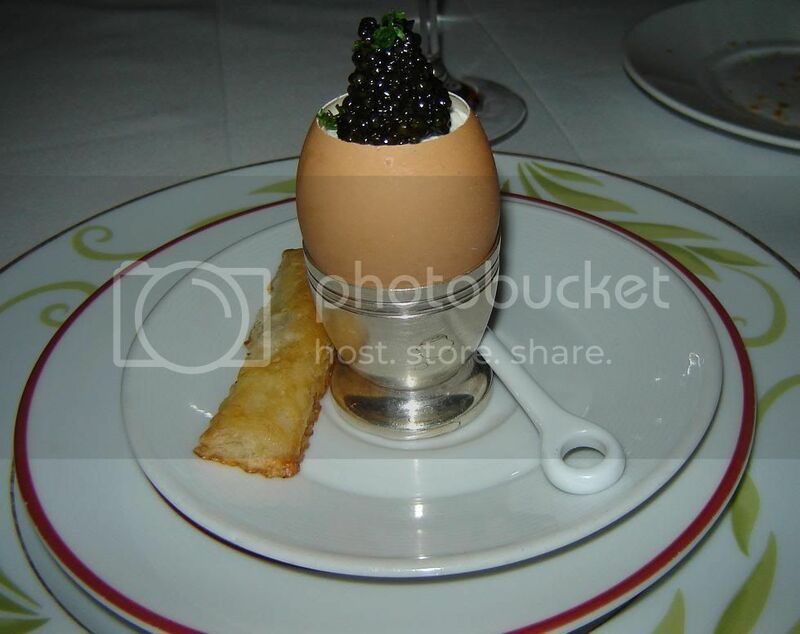 The Egg Caviar was good. Poached egg with cauliflower puree and caviar. The sweet onion-parmesan soup, on the other hand, was excellent. 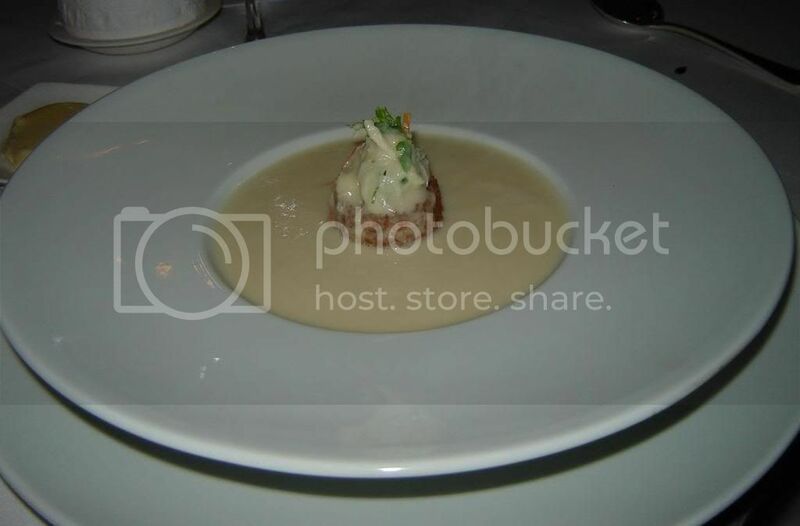 They bring out the bowl with the jumbo lump crab cake, then pour the soup on the table. The soup was smooth, and very flavorful. Not onion-y at all, and the crab cake was also excellent. Probably my favorite dish tonight (not counting dessert). One of the entrees we got was the veal and spare ribs. The veal was good and tender, but the spare ribs we thought were on the tough and dry side .... definitely have had better. 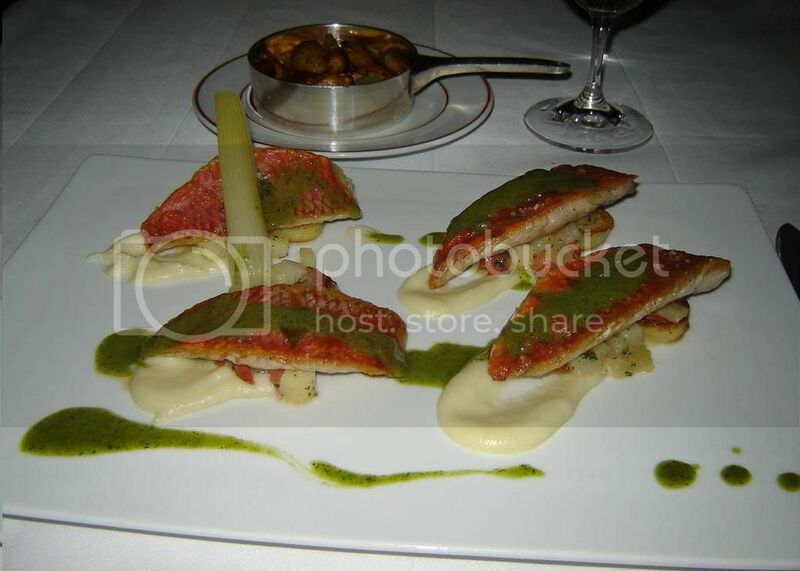 I ordered the Crispy Rouget, served with mashed potatoes, and roasted potatoes on the side. I liked the crispiness of the skin, and the sauce. However, after eating half of the plate I started feeling that the fish was a bit dry, and that there was just too much potatoes everywhere ... I liked the dish and thought it was good, but I wasn't really blown away. 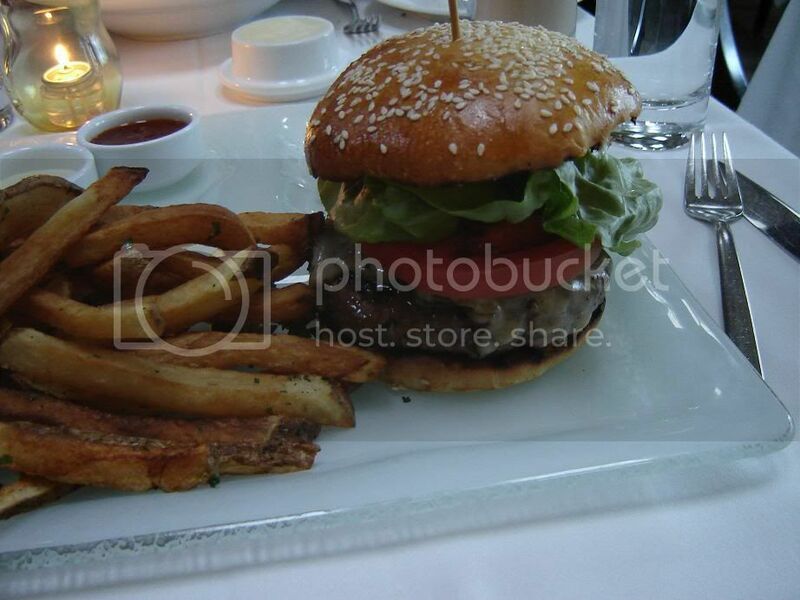 We felt underwhelmed by our main courses ... and when our waitress asked we let her know so. Pretty soon after, the manager (I guess) came by our table and asked what was wrong. We let him know that the ribs were tough and dry. 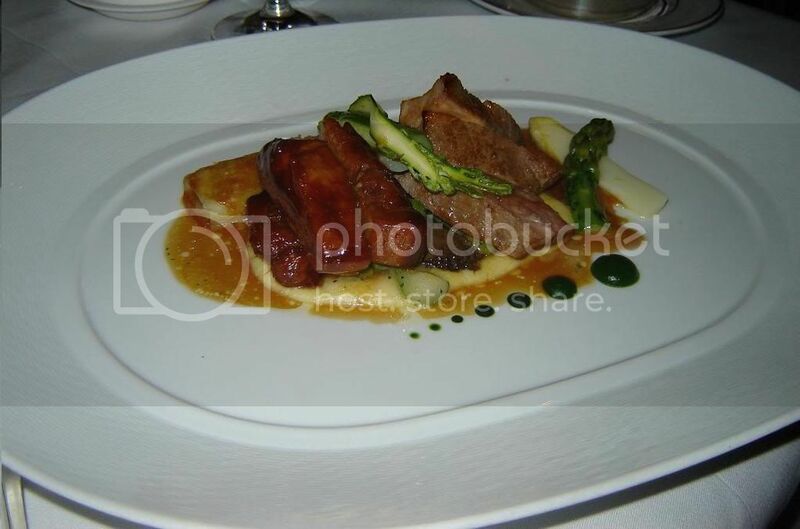 We also said though that to be fair we will come back and give them another try with the Carte Blanche tasting menu. He apologized and said that usually people are blown away, thanked us for letting him know and asked to give them another chance, then took our dessert order and said that the dessert will be on him. After our meal, I didn't know what to expect for the dessert, but the Passionfruit Parfait we got was actually excellent! This contains frozen passionfruit souffle, topped with coconut sorbet and pistachio tuile, then drenched with lemongrass milk. Right now, I can't say I'm in love with the place, although I am in love with that dessert. I've been to Bouley in New York, and as far as 2-star restaurants go, Bouley was much better. And right now I also like Providence better. But, admitting that I didn't order anything from the Seasonal specials, and didn't get the tasting menu (which I always do at Providence), I don't want to discount this place yet. They're up for another test. But, really, ice cream is what I was there for. 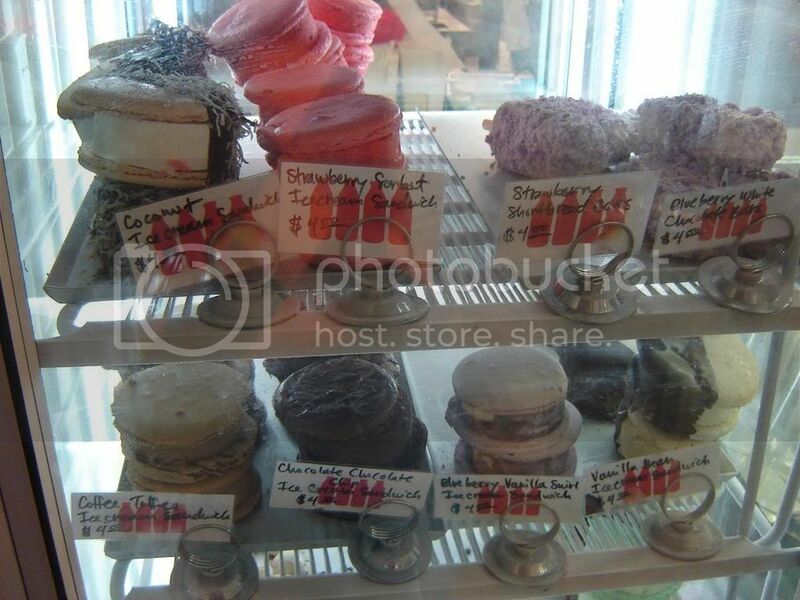 They have tons of interesting, yummy looking ice cream sandwiches, with favors like coconut and strawberry sorbet. I didn't try any this time, but next time definitely. Oh they also have ice cream bars that look rich and delish. 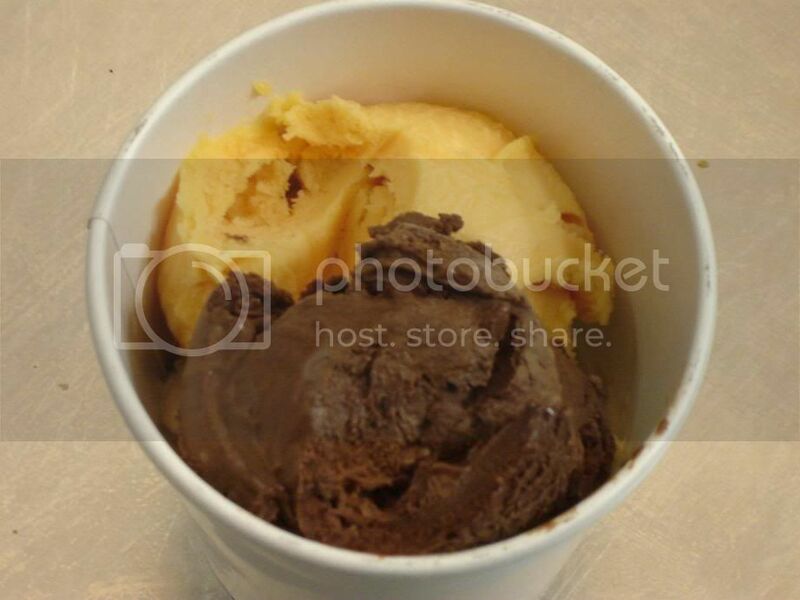 This time we just got scoops of ice cream: chocolate, papaya sorbet, and banana dulce de leche. All in all, I give them a thumbs up and I'll definitely be back! And try out all those yummy looking ice cream sandwiches. A couple of weeks ago we went to lunch with someone who was a vegan. Since we didn't really know any vegan places, we went along with her suggestion: Real Food Daily in Santa Monica. 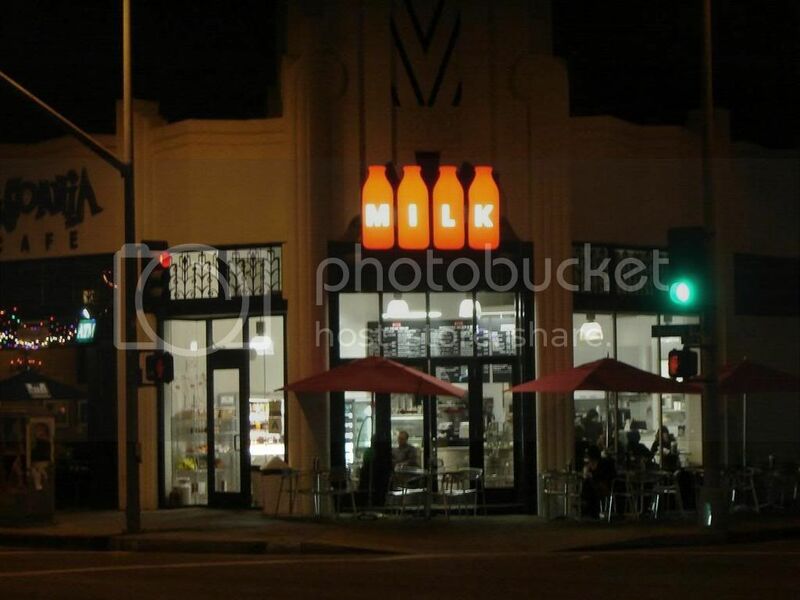 They serve purely vegan (and of course, organic) food, but with a lot more choices and innovation than most other places. Of course, you can still go with one of your salads or vegetable sandwiches. They have an amazing portabella mushroom sandwich with hemp bread! Give it a try! After that we've come back, and the place is always packed. The bad thing is that they don't take reservations, so you end up waiting for quite a while for it. Usually they will send you to the spiritual bookstore right next door and will come get you there when your table is ready. 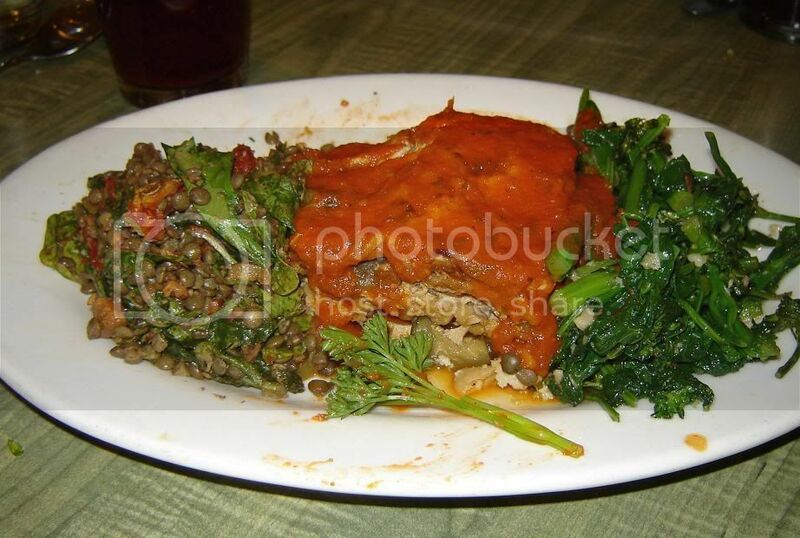 The special for March was this vegetarian lasagna, which was absolutely delicious (I didn't really catch what was in it, sorry ... next time). Also to note is the Better with Cheddar nachos for appetizer. They used melted cashew cheddar cheese and tofu sour cream and this was really really good. 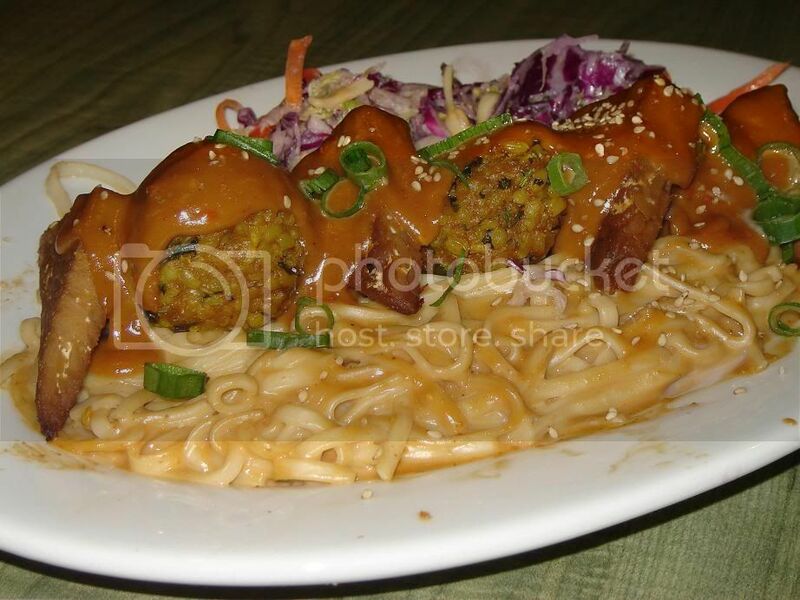 Someone got one of the specials which consisted of noodles in peanut sauce topped with some tempeh (for those who don't know, tempeh is made of soy beans- kinda like soy bean cake). I didn't get to try this, but they seemed to really like it. 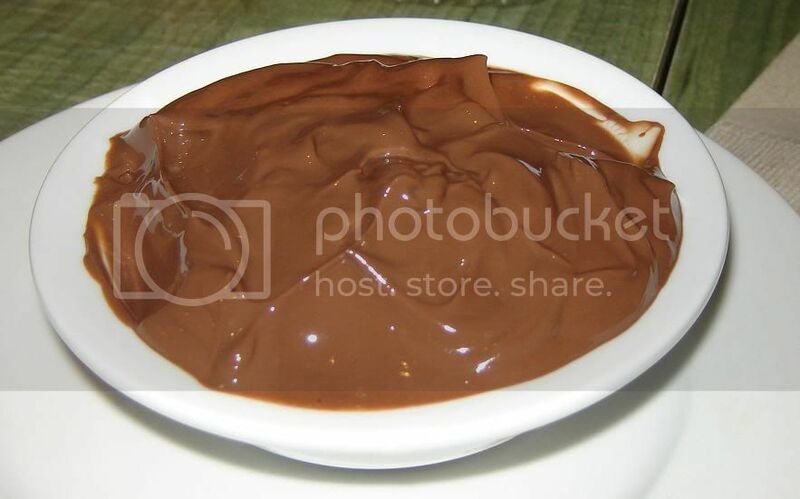 We ordered the chocolate pudding for dessert. Of course, dairy free and gluten free. And it was amazing. It tasted very rich and chocolatey.